Mangaluru, Mar 18,2017: Gender equality is one subject that needs a lot of attention. Though the government is doing its bit to achieve gender equality the bitter truth is that the atrocities on women has been on the rise. This can be checked when awareness is created in this regard at the school level itself. 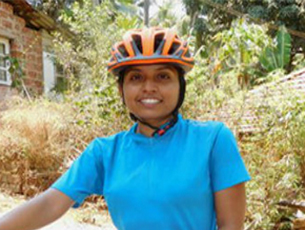 With this noble objective in mind a young and daring woman has embarked on a Kashmir to Kanyakumari cycle jatha. She is Shruthi, a software engineering graduate from Mysuru. By the way she is the younger daughter of late Shivashankera Murthi, the former vice chancellor of Mangalore University . Shruthi who embarked upon her jatha from Kashmir on February 8 has so far covered a distance of 3,400 kms. In course of her cycle jatha, Shruthi visits different high schools enroute and sensitizes female students on various issues pertaining to gender equality. Shruthi narrates with gratitude the co-operation extended to her by two of her classmates including Anagha who accompanied her in car upto Goa and arranged all her programmes in school. They had to return from there after their car developed a technical snag, she said adding from there she was alone in her journey and added she plans to reach Kanyakumari on March 24. On Friday she reached Tokkottu where sports photographer Anju welcomed Shruti at her residence at Pandithouse. Dedication ad determination is very important. Some have the passion of riding bicycle , we have wish her safe journey.